College internships generally offer good work experience, but in the best of cases, they are truly transformative. For Alexandria (Alex) Deitz, class of ’15, interning last summer with the Oregon Innocence Project radically changed her belief system. 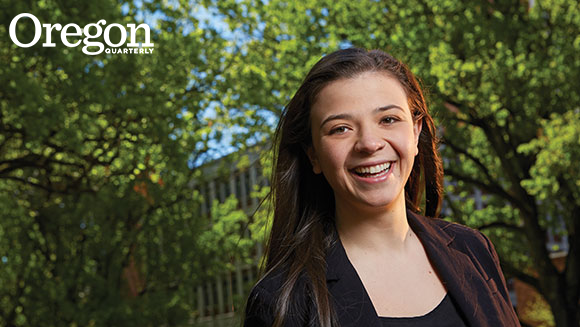 Deitz, a Dean’s Access Scholarship recipient who will graduate from the UO after just three years, describes herself as a “nerd” who loves to listen to Supreme Court oral arguments. While at the UO, she tutored student athletes in business, economics, and math; traveled to Russia on an exchange program; and interned with the OIP. “I don’t like to be bored,” she says, without a trace of irony. In typical fashion, Deitz didn’t just march the final mile, absorb the moment, and go home. She took action. Having heard that Oregon, one of the last states in the union to create an Innocence Project, was finally getting one started, she called the program’s founders and said she wanted to help. She was one of the OIP’s first interns and the only one who wasn’t a law student. And during those two months, something happened. “I will look at law completely differently,” says Deitz, who plans to study constitutional law and eventually enter politics. “I classify as a Republican, but being there opened my mind to the biases our judicial system holds—to problems that most people turn a blind eye to. The California 12, Deitz notes, has now become the California 11, with one wrongly convicted prisoner set free. “That might not seem like much,” she says, “ but it’s an entire life, an entire family, that’s affected.